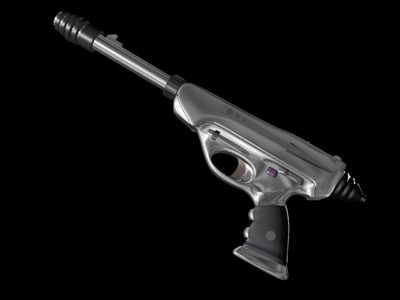 The sleek, stylish silver design of the Relby K-23 Blaster Pistol easily identifies it as a weapon that dates back to the time, when the way a weapon looked was considered at least as important as its effectiveness. At the time, a nobleman would consider his personal militia a thing of personal pride and elegance. Today, most weapons are designed with an emphasis on effectiveness, rather than appearance, as well as favoring firepower over accuracy. The K-23 on the other hand is a surprisingly accurate weapon. It is known for its low refraction index, which results in minimal beam dispersion when the blaster is fired. The beam produced by this blaster pistol inflicts excruciating pain upon beings who have the misfortune of being hit by it. The only known drawback of the Relby K-23 is its faulty safety. Last updated on Year 14, Day 27, 13:43:13.